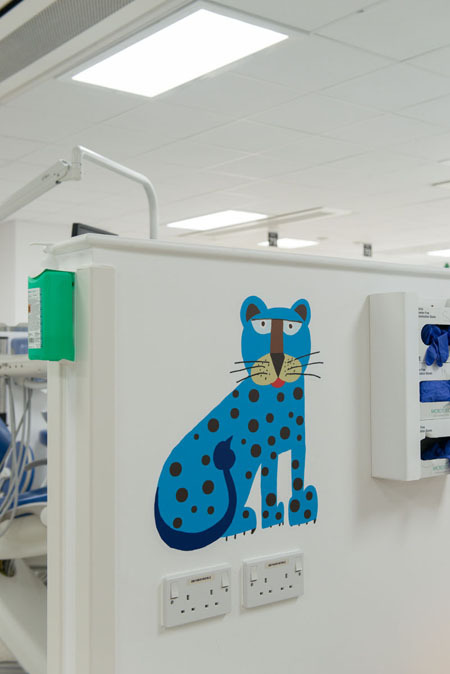 The artist’s challenges: Create artwork that appeals to young patients of varying ages in a location where there exists not one single large wall on which to hang your work for display. Sidenote, must be easy to sanitize. 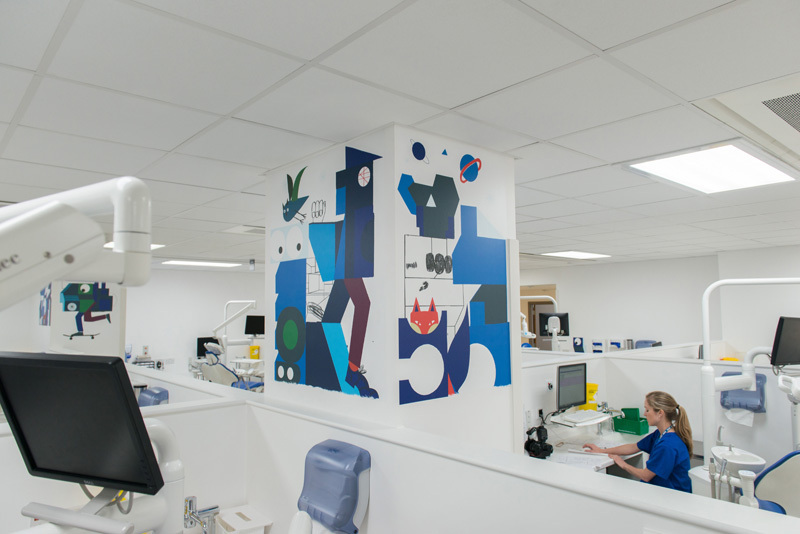 Illustrator Stephen Smith, of the Neasden Control Centre, explained to creativereview.co.uk how those parameters inspired his designs at Whitechapel Dental Ward: “It needed to be cool but not too scary.” As for the layout of the Royal London Hospital’s ward, busy with patients and furniture: “It was a major challenge to design and ensure that there was a good flow of work throughout the space and that not one single area was dominating another,” he added. 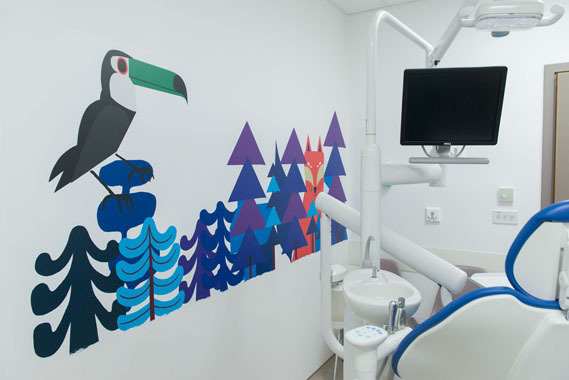 All the artwork was carefully measured to fit between dental practice furnishings, along corridors, around pillars. Which explains toucans perched above operatory chairs and cheetahs guarding nitrile glove dispensers. As for the aforementioned elephants, intermingled with skyscrapers and skateboarders, not to mention foxes, giraffes and hound dogs, the artist said he attempted to blend the patients’ familiar city vision with an imaginative world of the wild. 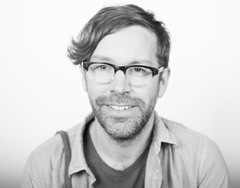 After being approached last year by Vital Arts, the arts organisation for Barts Health NHS Trust, Smith spent time with head doctors and staff on the ward as part of his creative process. His commission (in vinyl, in keeping with the cleanliness factor) was recently unveiled. Will a DNA test help defeat the scourge of oral cancer? PeriRx prepares for battle.